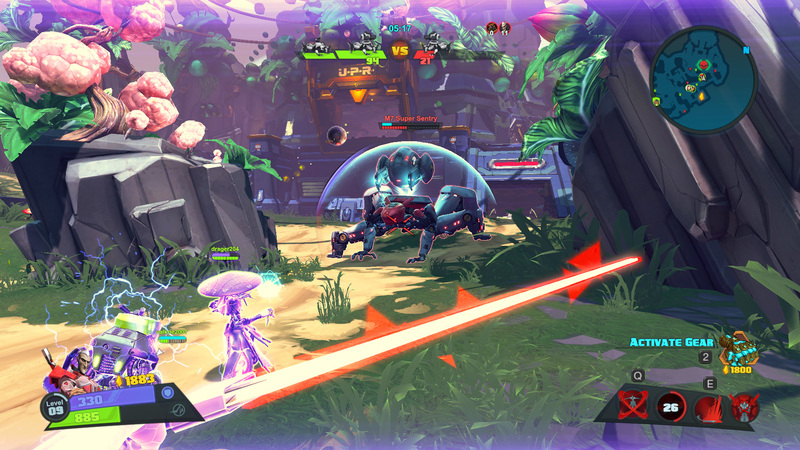 What happens when Battleborn tries to combine the FPS and MOBA genres? A mess. Let's put aside all the baggage that has built up around Battleborn over the past couple years and focus on the one thing that matters: It's not a terrible shooter in short bursts. I'd even venture to say that the actual gameplay can be pretty fun. That more than anything tells me that Gearbox had its heart in the right place with Battleborn. At a glance, it's not much more than an ill-fitting collection of borrowed characters and references - a Smash Bros. style tribute bereft of the reverence for the material it's saluting. But dig a little deeper and you'll find an interesting shooter, if a somewhat forgettable one. Like fellow Gearbox shooter Borderlands, Battleborn is at base a multiplayer shooter with a cartoony aesthetic and over-the-top sense of humor (like, really over-the-top). 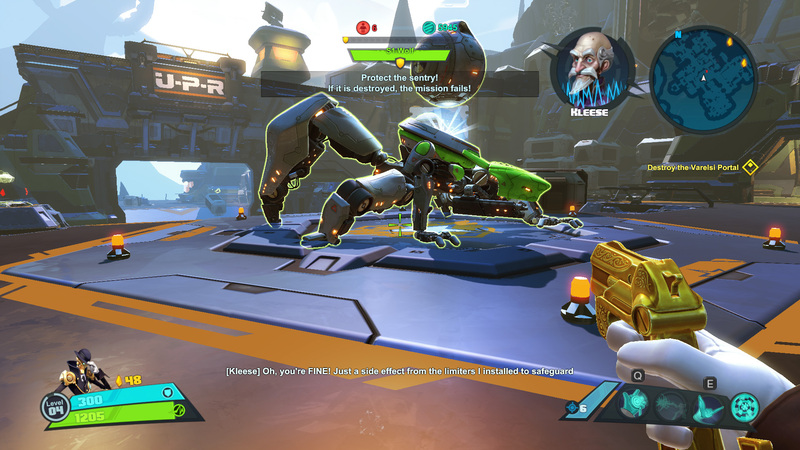 Unlike Borderlands, though, Battleborn is under no illusion of being an RPG. Instead, it's one part co-op shooter and one part competitive shooter, with Call of Duty-style progression and unlocks mixed in for good measure. Its strength and weakness is its expansive roster - 25 heroes with differing strengths, weaknesses, and team roles. It includes a penguin in a mech suit, a Sith Lord-like warrior, and a power armor-wearing space marine named "Oscar Mike," in case the reference wasn't on the nose enough for you. Each character starts off with two abilities, with a third unlocking once they hit a high enough level. In addition, each level brings with it a mini-tech tree where you can choose buffs for your character, weapon, or abilities, allowing you to customize them on the fly. Battleborn's large roster is a strength in that it offers many different styles of play, which keeps it from becoming too repetitive. If you get bored with Oscar Mike, there's always Rath and his swords, or one of the support characters. The large roster also encourages you to get a regular group of friends together and build a team with established roles, giving it some legs as either a competitive or cooperative team game. On the flipside, Battleborn's roster invites comparisons to Team Fortress 2 and the currently unreleased Overwatch; and with all due respect to Gearbox, it can't hold a candle to either of them. Team Fortress 2 is iconic, and Blizzard has some of the best artists in the business. When it's not outright stealing some designs (looking at you, Montana), Battleborn's collection of heroes is only striking in how generic it is, with even characters like Marquis the Gentleman Robot coming off more as cliche than anything else. But once the action gets going, most of the objections about its generic art and grating humor fall away. At its best, Battleborn is a fast, chaotic shooter in which 30 minutes feel like 10 - always a good sign in a game like this. Its core multiplayer design is ambitious but messy, combining MOBA concepts like minion escorts, mercenaries, and tower destruction with elements like turrent construction. The arenas are small and limited to ten players, ensuring that you will never go too long without engaging the enemy. It's actually pretty fun in the moment, but I nevertheless have a couple concerns out of the gate. First, I don't think in-game leveling works particularly well in a shooter, which is much more skill-based than your average MOBA. The helpless feeling that comes with being outleveled is even more acute in a shooter. Second, I don't know that it's great for random matches. Playing online, it seems like one team usually has an idea of what they're supposed to be doing while the other is totally clueless. Role synergy can likewise be hard to come by. This may be a symptom of it being early days yet for Battleborn, but it makes me wonder if the team-based control point mode will end up winning out in the end. One more thing: the three available multiplayer modes only have two maps apiece right now. Ouch. As for the campaign, it's decent as long as you bring along some friends. It's not impossible to play alone - I just rolled the third level with Marquis - but the huge number of enemies and bullet sponge bosses make it a bit of a drag. The missions themselves are huge, some of them lasting an hour or more, many of them with multiple bosses. You only get a finite number of lives with which to complete each mission, and it is quite possible to fail a mission objective, but they don't feel hard so much as time-consuming. They are clearly meant to be played with a group of friends, Destiny-style. Solo players might be happier focusing on the competitive multiplayer, or passing on Battleborn entirely. In the meantime, I'm still plugging my way through the campaign and periodically dipping into the multiplayer for some quick matches. I don't have a mode preference yet, but I've been leaning toward Capture, which is a fairly traditional control point mode. I have a lot of characters still to unlock - many of them won't become available until I either complete a particular objective or reach a high overall rank - so that's something to shoot for. My overall thoughts remain incomplete, though my current impression is a resounding, "It's fun in short bursts, but I don't know if it has any staying power." It doesn't deserve the hate that it's received, but neither has it earned a resounding recommendation. I guess we'll see if that changes. Tagged with 2K Games,	battleborn,	gearbox,	Reviews.